Angora is a smooth gray laminate with a very subtle, unique pattern in the finish that is printed rather than embossed. The overall effect is a medium, warm, gray color with a bit of texture. The pattern is a very understated print, similar to elephant skin, imparting a bit of an exotic safari into the closet or organization system. The pattern in this laminate is quiet enough to be easily mixed with other patterns and textures such as a heavily veined stone countertop. If your client is a wild adventurist at heart, but prefers to stick with a neutral, gray pallet, Angora just might be the color of choice for his new, natural habitat. 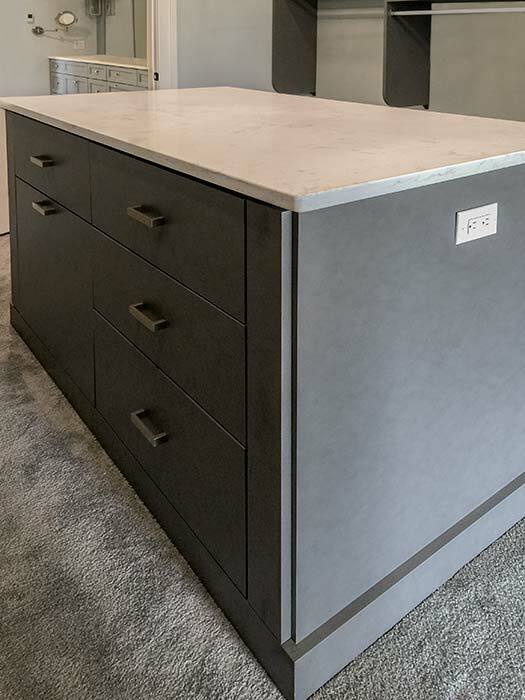 It looks great with oil rubbed bronze hardware, as the warmth of the metal brings out the warm gray tones in the laminate, but also pairs well with chrome finishes.